The IC 4017 can be considered as one of the most useful and versatile chip having numerous electronic circuit applications. Technically it is called the Johnsons 10 stage decade counter divider. The name suggest two things, it’s something to do with number 10 and counting/dividing. The number 10 is connected with the number of outputs this IC has, and these outputs become high in sequence in response to every high clock pulse applied at its input clock pin out. It means, all its 10 outputs will go through one cycle of high output sequencing from start to finish in response to 10 clocks received at its input (pin#14). So in a way it is counting and also dividing the input clock by 10 and hence the name. Let’s understand the pin outs of the IC 4017 in details and from a newcomer’s point of view: Looking at the figure we see that the device is a 16 pin DIL IC, the pin out numbers are indicated in the diagram with their corresponding assignment names. The pinout which are marked as outputs are the pins which are rendered logic "high" one after the other in a sequence in response to clock signals at pin#14 of the IC. Logic high simply means attaining positive supply value, while logic low refers to attaining zero value. Therefore with the first clock pulse at pin#14 the first output pinout in the order which is the pin#3 goes high first, then it shuts off and simultaneously the next pin #2 becomes high, then this pin goes low and simultaneously the preceding pin #4 becomes high...... and so on until the last pin #11 becomes high. After pin#11 the IC internally resets and reverts the logic high at pin #3 to repeat the cycle. This sequencing and resetting is successfully carried out only as long as pin#15 is grounded or held at a logic low, otherwise the IC can malfunction. If it is held high, then the sequencing will not happen and the logic at pin#3 will stay locked. Please note that the word “high” means a positive voltage that may be equal to the supply voltage of the IC, so when I say the outputs become high in a sequential manner means the outputs produce a positive voltage which shifts in a sequential manner from one output pin to the next, in a “running” DOT manner. Now the above explained sequencing or shifting of the output logic from one one output pin to the next is able to run only when a clock signal is applied to the clock input of the IC which is pin #14. Remember, if no clock is applied to this input pin#14, it must be assigned either to a positive supply or a negative supply, but should never be kept hanging or unconnected, as per the standard rules for all CMOS inputs. The clock input pin #14 only responds to positive clocks or a positive signal and with each consequent positive peak signal, the output of the IC shifts or becomes high in sequence, the sequencing of the outputs are in the order of pinouts #3, 2, 4, 7, 10, 1, 5, 6, 9, 11. Pin #13 may be considered as the opposite of pin #14 and this pin out will respond to negative peak signals, if a clock is applied to this pin, producing the same results with the outputs as discussed above. However normally this pin out is never used for applying the clock signals, instead pin #14 is taken as the standard clock input. However, pin #13 needs to be assigned a ground potential, that means, must be connected to the ground for enabling the IC to function. In case pin #13 is connected to positive, the whole IC will stall and the outputs will stop sequencing and stop responding to any clock signal applied at pin #14. Pin #15 of the IC is the reset pin input. The function of this pin is to revert the sequence back to the initial state in response to a positive potential or supply voltage, meaning the sequencing comes back to pin #3 and begins the cycle afresh, if a momentary positive supply is applied to pin #15. If the positive supply is held connected to this pin #15, again stalls the output from sequencing and the output clamps to pin #3 making this pinout high and fixed. Therefore to make the IC function, pin #15 should always be connected to ground. If this pinout is intended to be used as a reset input, then it may be clamped to ground with a series resistor of 100K or any other high value, so that a positive supply now can be freely introduced to it, whenever the IC is required to be reset. Pin #8 is the ground pin and must be connected to the negative of the supply, while pin #16 is the positive and should be terminated to the positive of the voltage supply. Pin #12 is the carry out, and is irrelevant unless many ICs are connected in series, we will discuss it some other day. Pin #12 can be left open. Have specific questions?? please feel free to ask them through your comments...all will be thoroughly addressed by me. The following example GIF circuit shows how the pinouts of a IC 4017 is usually wired with an oscillator for obtaining the sequential logic high outputs. Here the outputs are connected to LEDs for indicating the sequential shift of the logics in response to each clock pulse generated by the IC 555 oscillator at pin#14 of the IC 4017. You can see that the logic shift happens in response only to the positive clock or positive edge at pin#14 of the IC 4017. The sequence does not respond to the negative pulses or clocks. I was trying to make a calculator out of 3 4017 ICs. But every time that turn it on, all the LEDs start to flash like crazy, so fast that the LED’s are continuously on. The effect is the same as the “4017 AC Detector” that flashes LEDs whenever the 4017 detects AC voltage. (Here is a link to the schematic: https://1.bp.blogspot.com/-2u2mhjDhtk0/U7Pd0HaSfQI/AAAAAAAAAkc/bu758HGzXZc/s1600/Non-contact+AC+Voltage+Detector+ac+line+detctor+IC+4017+.png ). But you see, I DON”T WANT MY CALCULATOR TO ACT LIKE AN AC DETECTOR! I’ve tried to fix the problem multiple times but nothing would work! Do you have any ideas on how I can fix this problem? Thanks in Advance! How did you connect the 3 ICs with each other? Pin#14 will respond to each “high” clock signals and produce a corresponding sequential shift across its outputs. If the clocks are too fast the shifts will be also too fast. The shown idea is actually not recommended as an AC signal detector, because for any CMOS IC the inputs should never be kept floating, it must be either terminated to a + or a – supply rail, otherwise it may lead to a slow deterioration of the IC performance. How do I make a counter count up to five? Pin 10 should be connected to pin 15? Pin#1 should be connected to pin#15 for getting 5 sequential repetitions. Hi, thanks for the circuit. Happy Christmas. I want to build the sequencers for use with eurorack music modules to provide adjustable control voltages. The clock pulse will be supplied whenever a drum pad is played. Because the clock signal will therefore be intermittent, should I clamp pin 14 to negative supply with a 100K resistor in a similar way to pin 15 clamped to ground? Hi, Happy Christmas to you too! yes a 100K to ground is OK, and also a 10uF capacitor in parallel with this 100K will be required, you can tweak this value to suit the needs… this capacitor will actually help to rectify the intermittent signals and enable a constant voltage to the pin14 of the IC…. pin#12 of IC 4017 is the carry out pinout, which will enable carrying forward the frequency from the IC 555 to probably a next similar stage. Hi, which IC stalls? is it the IC 4017, can you tell me what exactly happens?? I’ll try to solve it for you…. There is a 555 and a 4017, I’m not sure which one is acting up. What I have is an “Atari punk console” with a four tone sequencer , 4 100k potentiometers for tones and a 500 ohm (I think) for speed. It works but when it is running and I increase the speed, it will only go so fast and then stop on one of the tones. I was adding a keyboard to it the other day and so I was moving the boards around and such and I was testing it while I was working on it to make sure things were still working and I noticed it would then go as fast as I wanted it to, like to infinite. When I repackaged the whole thing and it was finished it was back to stalling again. So im not sure if it’s the 555 or the 4017. Sorry kind of a newbie thanks for quick response. Good day Sir, I want to 4017 and band switch to on two LED which means I need only two pins to work (0,1) and it should restart again and the pressing of the switch will control it. How can I do that Sir. pls how do i build a a reading lamp of 24 LEDs with 6volt 4.5amp battery ? make 12 strings of LeDs having 2 LEDs in series on each string…connect all the ends of these 12 strings with the battery terminal with correct polarity. I am tryingto build a Device by using 555 +4017 as an sequencers . Btw I have many questions but the later I'll discuss first I would like to know what ll be the voltage in 4017 outputs​. This question is because , I am building a device in which every pins of 4017 outputs have been connected 3-4 LEDs and as well several ICSof 4017 are connected in series with the same outputs configurations​ so please let me know or if you have any better simple solution for me thankful for your concern .. It looks like your IC is faulty or the transistors are faulty,….because all the NPN cannot stay ON together when connected to an oscillating IC 4017 circuit. Therefore for getting 8 channel effect, you must connect pin#9 with pin#15. I make this circuit with 10 led. I want to use this circuit in fence guard for when anyone traped in fence then count 10pulse after than it is off using 555 timer for small time and after than it continuous to work. But problem is that I give 12v supply using battery.and using second battery I turn on fence guard .but I don't connect fence guard with any connection with counter circuit but every pulse it counts.as I remove 13pin from ground then also counter circuit counts. As we know fence guard is generate 10kv pulse so due to mutual induction counter circuit start count. Counter circuit and fence guard machine is totally isolated and keeping distance with 1feet but it counter starts and one by one led glow. How to remove this effect. Hello Vikas, I cannot suggest until I see the entire schematic and how you have integrated the two stages with each other. I really appreciate your patience and extensive knowledge. I don't think I made myself too clear in my previous post. What I would like to do is to make 7 outputs strobe very fast for 1 cycle and then all 7 outputs should stay on while a positive voltage is present. I wish to use 20 leds. Should pin 15 be grounded via a 100R resistor? Hi Max, the 4017 and N1 are responsible for the chasing action, N2 is used for producing multiple strobe flashes on the LED while it is chasing. If you are intending to allow the LED to chase upto 7 sequences, in that case you eliminate the N2 output connection with the LED, and connect the LeD cathode ends to ground. hi,i just want to ask,how many voltage power that's in the pin 7(vss),pin 10 and 11(ac power)if my vdd is 12v?if cd4047 just could make the ac signal without amplify so it's not useful than an ac circuit? I am using a 555 with 4017 to make tri color less with a common cathode dance. How would you do this ? WHAT IS THE RESULT IF WE CONNECT 15 TH PIN TO THE 4TH PIN? T-intersection of 2 way roads. Requirement of 2 traffic lights. Requirment of 2 traffic lights. can you suggest a substitute for 4017? Hello Puneet thanks!, there's no easy way of checking ICs such as 4017, the only way is to build a standard configuration and see if all the pins are responding as per the specs. Sir how to ensure whether the output pins of 4017 carries the voltage equal to the supply voltage ? configure the IC as per its standard layout, don't put any clock at its pin14, keep pin14 connected to ground, and measure the output at pin3 or whichever pin may be high at that instant. Here are the LED dance floor modules (tiles) stacked. 1) AUDIO INPUT: The LEDs will be illuminated in response to the music signals received at the input of the circuit. 2) MANUAL INPUT: Each module is installed with a tap/weight sensor. The circuit will illuminate LEDs in different combination (randomly) in response to a tap or weight change detected by the sensor. For the 1st option, an audio spectrum circuit can be used. For the 2nd option, I was considering to use the 4017 circuit. The original circuit is based on microcontroller but, I am trying to do without it. That's interesting Abu-Hafss, I'll try to include the idea in my blog soon. Firstly, for the 1st set (of 4017+oscillator), we have to deploy a non-555 configuration to achieve such low frequency oscillation……right? Secondly, where the push-button will be deployed? Lastly, can a Random Bit Generator Circuit be used to achieve the goal instead of your above-suggested configuration? I have seen a circuit of a Random Bit Generator using a few 2N3904 transistors and a TTL NOT gate, but not sure how it would perform for our application. Another idea is to use an ordinary multicolor LED which generates quite a random automatic blinking rates, this could be integrated to the 4017 pin14 while the monostable output attached with pin13 (after inverting) of 4017 and directly with the common cathodes of the LEDs. I would be publishing it soon in my blog for you to see. You didn't replied the first two questions. Actually, I planned to integrate this circuit in a larger project (LED dance floor) which will illuminate LEDs in different configuration/colors, randomly in response to a foot-tap. we can use a 4060 oscillator to facilitate the use of smaller timing capacitor. The push button could be across pin2 and ground of the monostable. Can you please explain how you would want to implement the same in your application (LED dance floor)?? I want to use this IC for 10 random outputs. According to my understanding, the CD4017 would keep on repeating its output cycle as long as the clock is fed at pin#14. My idea is to use a push-switch, which when pressed momentarily should send clock signals to CD4017. Ten LEDs are so connected that during the counting process no LED should light up. When the clock is disabled and the counting process stops, any one LED should light up randomly. If the push-switch is used to trigger an monostable oscillator, which in turn activates a clock oscillator, the monostable would always stop the clock at fixed time which ultimately cause the CD4017 to stop it counting process at a fixed output pin. Please let me have your valued suggestions. Thanks for such a simple solution. But as I mentioned earlier, the monostable would always stop after a specific time hence, the clock would also stop after that time which ultimately would always light up only one particular LED. How to resolve this issue? "Ten LEDs are so connected that during the counting process no LED should light up. When the clock is disabled and the counting process stops, any one LED should light up randomly"
That's exactly what will happen if we implement the method suggested by me in the previous comment. You present question is contradicting the previous question, I did not get it. By "one particular LED" are you assuming that the 4017 would get reset and pin3 LED would always light up?? I mentioned in my very first post, "According to my understanding" which could be wrong. What I assumed is that in an electronic dice circuit, we have to press the ROLL-ON-DICE push button to send the clock signal to CD4017, which will start the counting process until the push-button is released. And during this counting process, the LEDs would turn ON/OFF in the counting sequence until the push switch is released, and then finally one set of LED would light up. IN SIMPLE WORDS, THE RANDOM SELECTION DEPENDS UPON THE DURATION OF THE TIME FOR WHICH THE PUSH BUTTON IS PRESSED. Whereas, in my case, if we deploy a monostable oscillator to trigger the clock signal to the CD4017 then the monostable would always stop the clock signal after FIXED TIME PERIOD as set by the timing components. This means the clock signal would always be fed for that fixed time and ultimately the CD4017 would always stop the output at a specific pin. OK now I got it, but why do we need a monostable anyway? We can use an astable instead. …I mean the push button would charge a capacitor, whose level of charge would determine for how long the astable could supply the clocks to the 4017. Again……., the level of charge of the capacitor will be directly proportional to the time for which the push-switch is pressed. Monostable oscillator was just my idea as a starting line of action. I just want a push button to be pressed momentarily which should (somehow) trigger clock signal to the CD4017, always for variable length of time !!! The capacitor should charge relatively slowly, it should be dimensioned such that it takes about 10 seconds to get fully charged, Since nobody would hold the switch for so long would allow different charge level for the subsequent pressings. Also the astable whose switch ON time would depend on the charge level of the above capacitor should be dimensioned for producing a very high frequency. Together, the configuration would force perfect random results from the 4017 outputs, this is what I assume. may be I misinterpreted your requirement, you don't want the pressing duration to be influencing the result….in that case it will require some thinking and it would make the circuit a bit complex for achieving that. One easy way would be to use another set of 4017/oscillator stage fixed at 1 or 2 Hz sequencing rate, then use these sequencing outputs to provide randomly selected capacitors for the monostable. This would continue for as long as the system stays powered, that means the monostable would be producing slightly different delays randomly for each flick of its pushbutton. 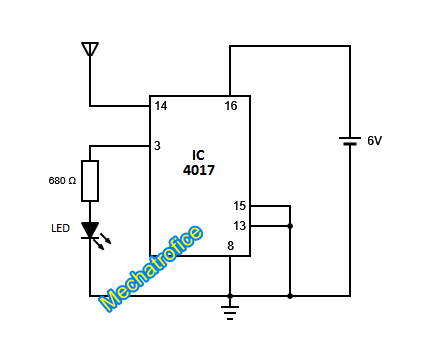 Hi I am going to be using this IC in the LED dice with slow down project and I'm looking to connect a sound generator circuit with a flip flop to produce a sound when the LED's come to a stop. I wanted to know what pin on the 4017 will have a positive output once the LED sequence has come to a stop? Hence so I can connect the input of the second circuit (the flip flop) to that pin. The output will be random and never fixed to a definite pin. It will depend on how many clocks are applied at pin14 of the IC. It will begin from pin3 and sequence by one pinout in response to every positive pulse at its pin14, as soon as it reaches pin11, the sequence returns back to pin3 for repeating the cycle. sir,my name is karthie…i need to know where where this was used…? Hi Karthik, one example can be seen in light chaser circuits, just type "light chaser" in the search box above, you will find the related articles.